Today is the fifth one. I look into the mirror and add touches of mascara to my non-existent eyelashes. The reflection has become a stranger. “Naina, are you ready? The guests have arrived,” mother calls from the kitchen. Ah! The audience is early, I think. curiosity, I do not look up. Not a muscle in my face twitches. I just look at their feet dangling from the sofa, which is too high for them. There is only one female this time. 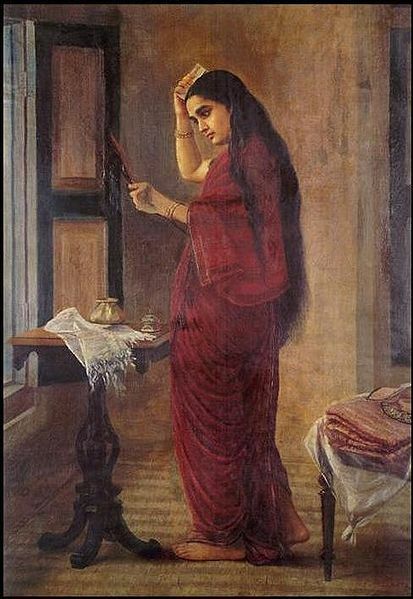 She is wearing the traditional thick anklet. There are silver rings on her toes, a stamp of marriage. Suddenly, an image of a cat with bells ringing at her neck comes to my mind. This may be my future mother-in- law. So, it’s natural that I feel a bit antagonistic towards her. The boy is a little overweight, going by his lower profile. His friend or cousin is better off, I think, by the trousers he is sporting. “Tell us your name,” asks the lady with the silver rings on her toes. Definitely belongs to the feline species, I think. “How educated are you?” says the cousin. Before this is over, I am bound to produce all the animal sounds I had taught my two year old niece. The only sound I can’t do, is roar. Pity. This was a warm up. Now everyone is assured that they are somehow more intelligent than the bride to be. Someone points to the picture hanging on the wall. Do I really have to answer that? “The one holding the sudarshan chakra is Krishna,” I say, a little too sweetly. “Who may I ask is ever going to take that silly weapon seriously?” grunts the lady in red. “Silly weapon?” asks my father dubiously. “It is nothing but a glorified designer flying disc.” She snorts. She truly is an original. From where did they dig out such a precious gem? “Yes you are quite right. On giving the matter sufficient thought, I believe I would have to agree with you,” says my father, ever the diplomat. “Come closer,” says the precious gem. I suddenly feel very small as I move towards her. Her mouth is too wide, I hear someone whisper. I try to still my fidgeting hands, wondering if it is over. “You can go now,” says my father. As I return to the kitchen, I hear, “She’ll do, I suppose.” No doubt, from my precious gem. I feel I’m prepared for this, but each time, I come up lacking. For now the exhibition is over, and the audience is assured , the exhibit is neither deaf nor dumb and does not limp. For now they look satisfied with the exhibit. The result will be out in a few days. Failure means another exhibition and another until I pass. Copyright © 2019 Chaitali Gawade. Powered by WordPress. Theme: Spacious by ThemeGrill.